good morning, Monday: hello, 1990s. So, I hope no one question’s today’s “good morning, Monday” material, because this is the stuff my little girl dreams were made of. Now I’m off to continue studying for this morning’s Russian quiz! Thankfully, I’ve got my girl Mariah to belt out sweet tunes for me as I get ready. I just have to tell y’all – today is a pretty special day. 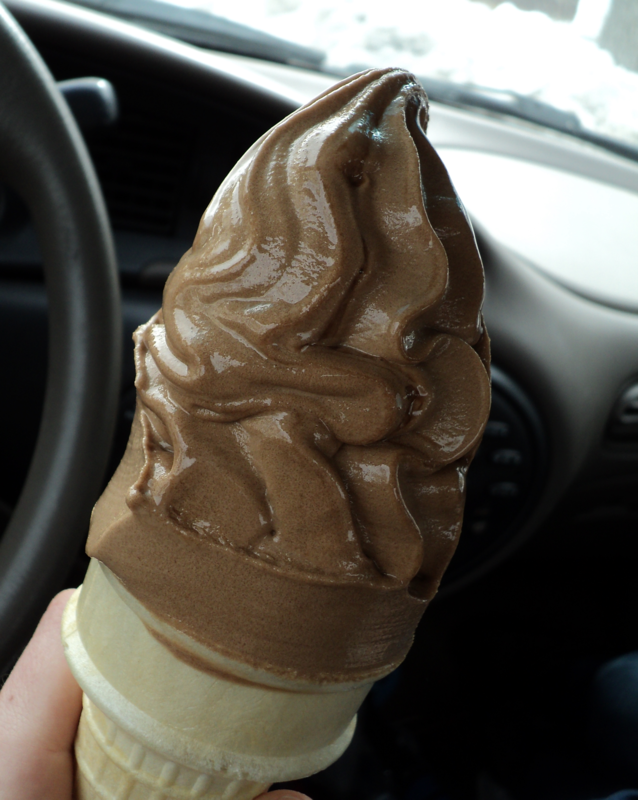 Earlier this afternoon I was lamenting at my inability to consume my favorite take-out treat of all treats: soft-serve ice cream from Red’s Dairy Freeze. See, here in coastal Maine, we watch each fall as some of the best local stores close up shop for the winter. For obvious reasons, ice cream takes a big hit around here during the colder months (apparently, I’m in the minority of folks who love ice cream in the winter). Each October, I’m most heartbroken when Red’s Dairy Freeze gives into the dropping temperatures and ends their season. Red’s is an institution in Greater Portland, and is perhaps the most beloved ice cream shop in all of Southern Maine. It was the only place in town that my family ever went to for ice cream, as Red’s offers non-dairy options (in childhood my brother had allergies). A lifelong patron, I’ve never tired of their Boston milkshakes nor the candy eyes they affix to each cone of sugary soft-serve. Additionally, now that I’m a dog owner I have a new-found appreciation for the dog-size dishes that Red’s offers for furry friends. 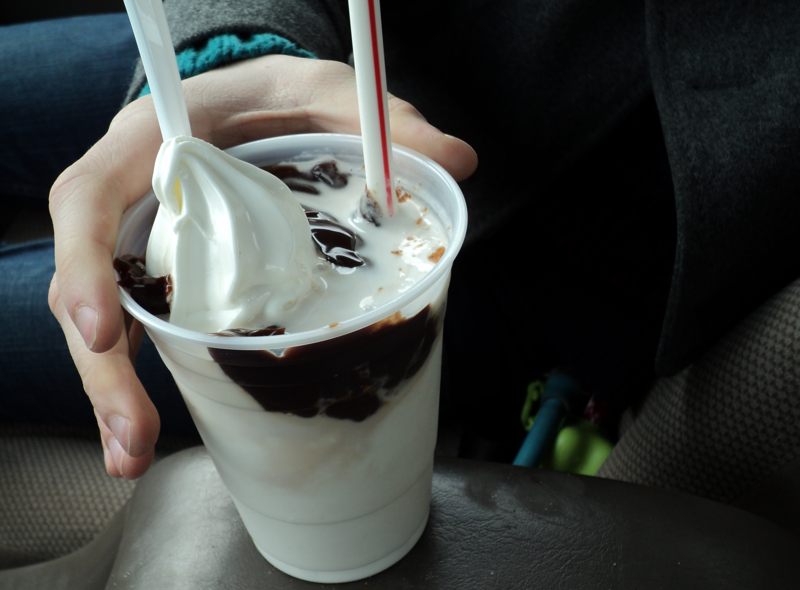 Opened in 1952, Red’s has been serving up soft-serve ice cream non-stop for decades. There is one very sad exception to this. Two years ago, at the very beginning of ice cream season, the unthinkable happened: Red’s had a fire – and it was bad. The damage was extensive enough that they remained closed the entire year. It was the first year in my whole life I didn’t have Red’s ice cream. Luckily, the owners and staff rebounded and reopened the next year. They even printed t-shirts that proclaimed, “I survived a year without Red’s!”. I’m sure y’all have figured out by now that today is a special day because Red’s has announced that they’re reopen for the season! Just as I was beginning to feel that winter was dragging on a bit too long, I’m gifted this perfect sign of spring. Red’s? Did someone say Red’s!? 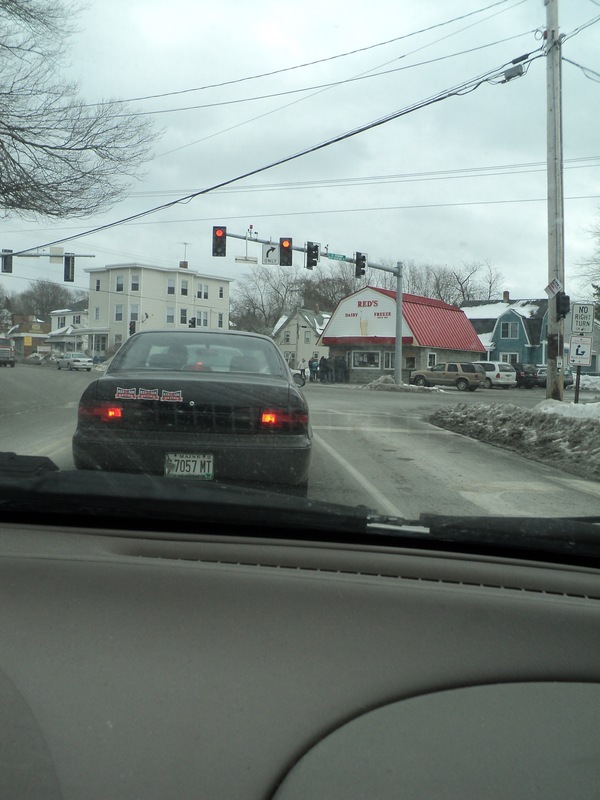 This red light tried to kill us with anticipation! 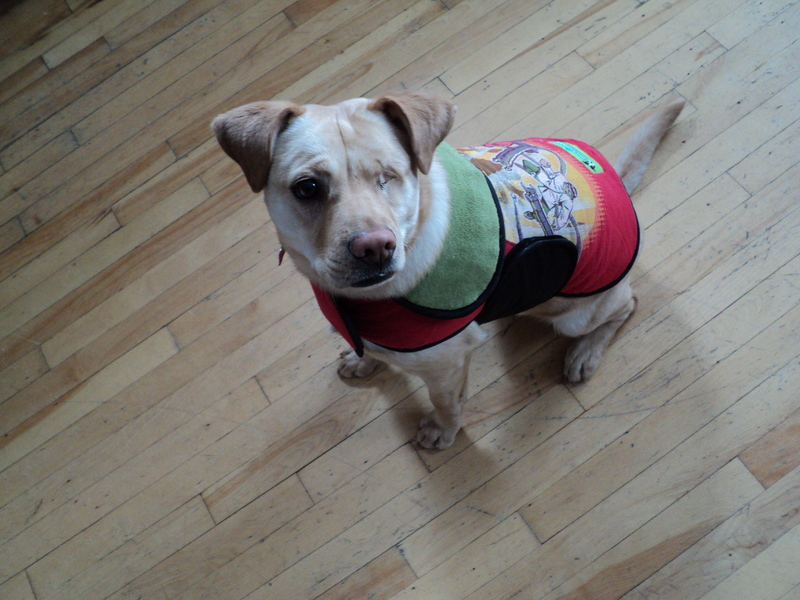 I never manage to snap pictures of the candy eyes – I always eat them too fast. This means spring is near, so ignore all the snow and get your sunscreen ready! It’s past midnight and I just can’t seem to sleep. Perhaps that’s because I’m so anxious to hear whether or not my university will cancel tomorrow’s classes due to the snow storm that’s currently raging outside. The weather has been unseasonably warm all winter, and we’ve seen much less snow than usual. While I’m not typically one to bemoan the lack of snow, I’ve never lived outside of the Northeast and am thus accustomed to at least a little of the stuff each year. But what really irks me about this years missing flakes? Not nearly enough snow days. Really. I’m particularly obsessed with them for a woman of my (or any) age. On planned days off (weekends, vacations), I find myself struggling to balance my divergent inclinations to vegetate while watching junk television and also be productive. Whenever I relax, I feel a bit like I’m slacking off. Being in school means I always have assignments, and because academics are my first priority, even fun DIY or home-improvement projects feel like indulgences. But snow days are so different! Snow days are an unexpected gift of free time. Glorious, unplanned for time! All of my assignments are completed as if I would have been in class, so snow days are all about taking it easy. Plus, there’s the added bonus of the roads being so terrible that it’s frowned on to be out and about. Snow days give me the awesome ability to keep my pajamas on, watch my favorite old shows, and create unhealthy snacks all day long. I guess that’s why I’m so excitable about snow days. Because I am in a state of such sleepless anticipation, I’ve put together a list of the things I’ll do tomorrow if school is, in fact, cancelled. I think it’s a pretty solid plan. When it comes to any activity that can be infused with a childlike sense of silliness and/or gluttony, I am your girl. Ice cream for breakfast followed by an indoor water balloon fight? Sounds great! Granted, nothing I’ve dreamt-up for tomorrow is too crazy, but I think I’ve mapped out an absolutely indulgent day. 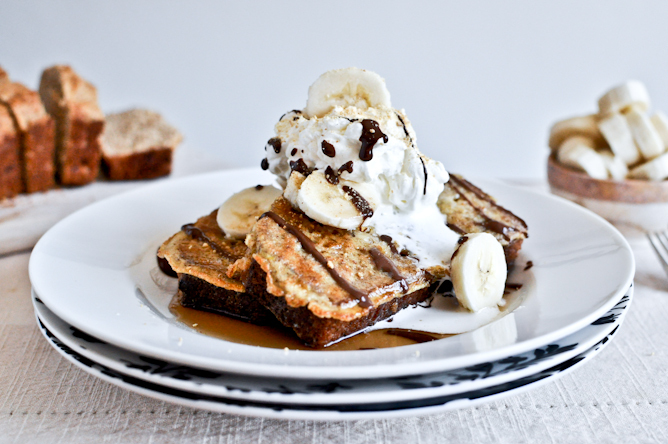 1) I have three past-prime bananas just dying to help me start my day with this banana bread french toast! I’m absolutely making this first thing tomorrow – perfect beginning to a snow day. 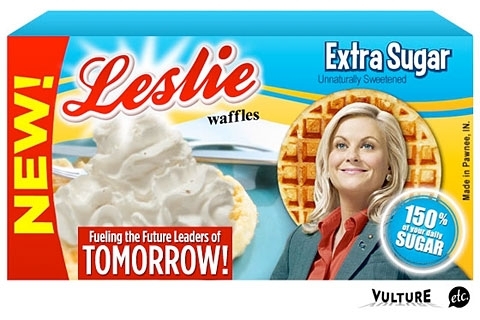 Plus, whipped cream is a very important food. 2) I am going to hunker down in my fuzzy, polar bear-laden pajamas and watch a serious amount of garbage television. Specifically, Supernatural. I know what you’re thinking, “Really, Andrea? Supernatural?” Yes. Yes, it’s hilarious and I love bad TV with predictable story-lines. I love that sort of program even more when it mocks itself within the show, which Supernatural does in spades. Clearly, Sam and Dean Winchester know what relaxation is all about. 3) Once I’ve had my fill of TV, I think I’ll try out this project I spotted on ye old Pinterest. Homemade candy buttons made of things I already have in my kitchen? Yes please. Here’s a link to an actual recipe, the following photo is just my wishful-thinking version of what my candies will look like. 5) I think I’ll round out my snow day by putting together something savory and warm in the evening. This recipe for “Volcanoes” – tiny bread bowls full of potatoes and cheese. And there you have it, my plans, should this snow day happen. My windows are covered with white flakes, so that’s a good sign. For now, I should try and get some rest in case some freak weather accident happens and I actually have school tomorrow! Is anyone else up late tonight hoping for a day off tomorrow?